La velata, or La donna velata ("The woman with the veil"), is one of the most famous portraits by the Italian Renaissance painter Raphael. 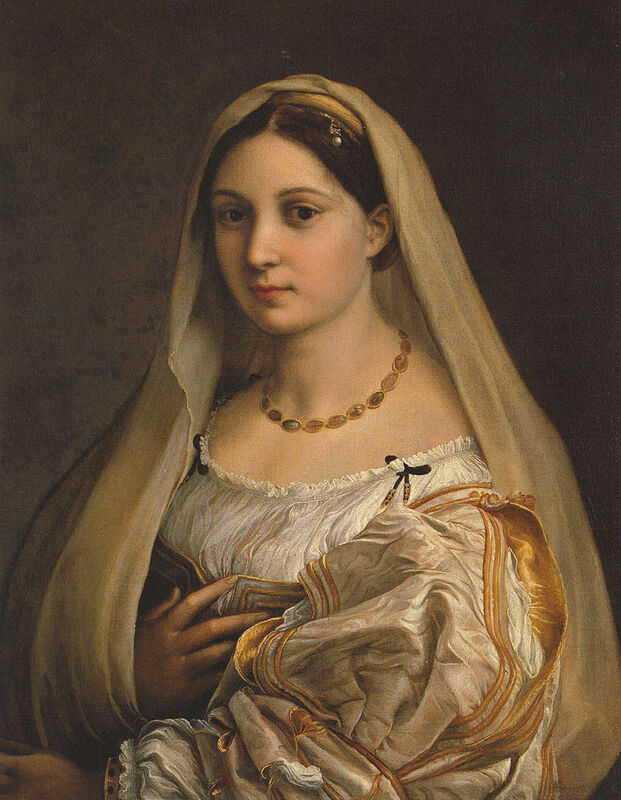 The subject of the painting appears in another portrait, La Fornarina, and is traditionally identified as the fornarina (bakeress) Margherita Luti, Raphael's Roman mistress. It doesn’t take much in my mind to associate two famous paintings by Raphael with my b+w portrait of Kimberly Holcomb. 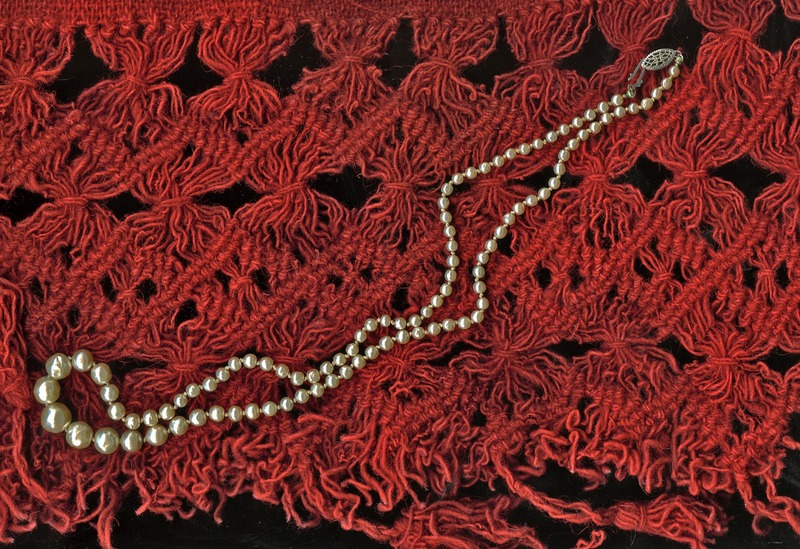 Baroque pearls are pearls with an irregular non-spherical shape. Shapes can range from minor aberrations to distinctly ovoid, curved, pinch, or lumpy shapes. Most cultured freshwater pearls are baroque because freshwater pearls are mantle-tissue nucleated instead of bead nucleated. Cultured saltwater pearls can also be baroque, but tend to be more teardrop-shaped due to the use of a spherical nucleation bead. Baroque pearl, pearl that is irregularly or oddly shaped. Pearl formation does not always occur in soft-tissue areas, where the expanding pearl sac grows regularly because it encounters no appreciable resistance. Pearl cysts are sometimes lodged in muscular tissue, for example, where, unable to overcome the resistance of tough muscle fibres, they assume irregular or unusual shapes. Baroque pearls were highly prized by Renaissance jewelers, who saw them not as misshapen products of sea mollusks but rather as unique and exquisite natural forms. They were often used in pieces of jewelry to form the bodies of figures. A superb example is a piece from the 16th century known as the Canning Jewel (Victoria and Albert Museum, London), in which a large baroque pearl is used for the torso of a sea figure having the body of a man and the tail of a fish, the whole mounted in enameled gold set with pearls, rubies, and diamonds. 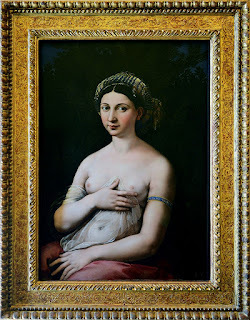 I told Rosemary that for the all-woman performance of many of our favourite Vivaldi works this December 23 at the Chan (including the magnificent Gloria in D major, RV 589) I wanted her to wear my mother’s pearls. We looked and we looked. They were gone! I suggested that perhaps we had forgotten that we may have left them in our bank box. Rosemary’s text from the bank, “They are here,” was a relief and most satisfying. My wife and two daughters Ale and Hilary (in their 40s) and our 15-year-old granddaughter will be sitting all on a row on the 23 savouring the Gloria which has been part of our family tradition for our Nochebuena (Christmas Eve) dinner since 1971. In fact we first heard the Pacific Baroque Orchestra for the first time in 1996 at Ryerson United Church when they performed that work with the Elektra Women’s Choir. This time around it will not only be the chorus and soloists but the orchestra, too will all be women! Since Rosemary and I lived in Mexico City from 1968 to 1975 (and I had lived there off and on since 1955) we knew all about baroque churches with their elaborate gold leafed retablos (altars and altar pieces). In Mexico we learned of an even more intricate and elaborate form of the baroque and this was in the difficult to spell word Churrigueresqe named after Spanish architect architect and sculptor, José Benito de Churriguera (1665-1725). The style was important in Spain until the 1750s but was copied and elaborated with even more complication by Mexican architects. You can bet that on December 23 while we listen to "the women" our memories will be of flickering lights in complex gold leafed Mexican retablos. Sometime in the 90s I met up with Tsleil-Waututh leader Leonard George at the North Vancouver aboriginal burial ground. It was a very cold early December afternoon. Vancouver Magazine at the time had a last page feature where they answered readers’ questions. Someone had asked why so many of the tombstones in the North Vancouver cemetery (perhaps they were not aware that it was a First Nations one) had the surname George or John. 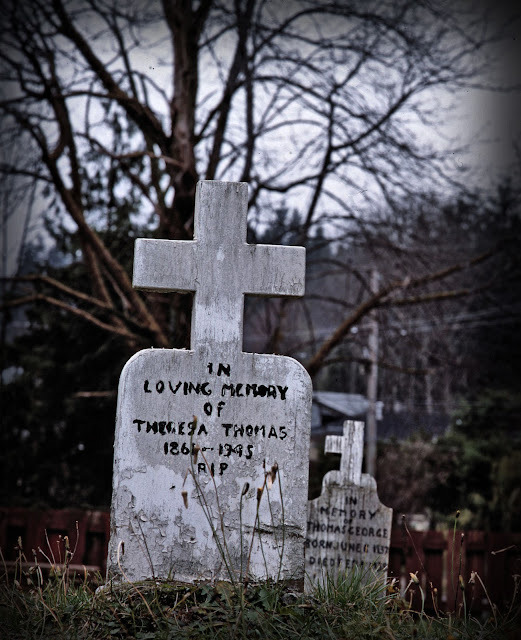 I was dispatched to photograph a tombstone. Within a week a gentleman by the name of Moving Rock came in and wanted to rent a station wagon. I looked at him and at that point I knew I was going to give him a car no matter what. The man and car disappeared weeks later. The station wagon was found somewhere in Arizona. I was almost fired. Len George was there at the burial ground to make sure I took my pictures with respect to the buried. He explained as it began to snow that there was a belief that people lived winter with the anticipation of spring. If they were alive when spring came then they would survive another year. I find it interesting that George died this past December 6 at age 71. I am 75 and I will keep in mind the gentle man’s belief. My new camera, the dedicated, no longer a phone, iPhone3G has left me excited at all its possibilities. Its one failure is that when I use it in my small Kitsilano studio with the hot lights that are built into my studio flash system the exposure used is a slow shutter I cannot control. Because the iPhone is heavy it feels firm in my hand. But some of the resulting pictures have been a tad soft because of “camera” shake. I went to Leo’s on Granville and friendly Jonas showed me four clamps with which I can attach my iPhone3G to my heavy Manfrotto tripod. 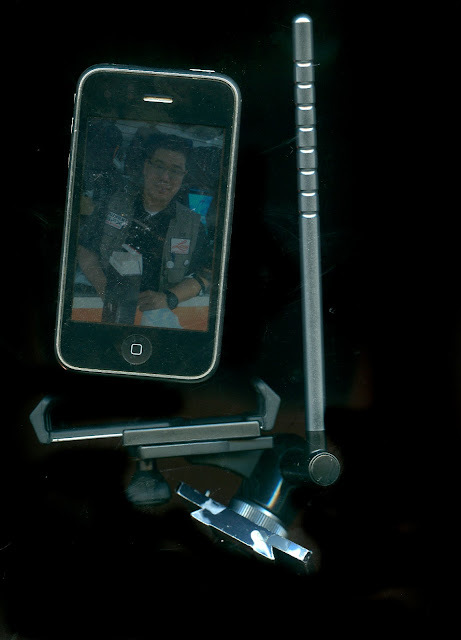 We decided on the more expensive Joby as it can easily be switched from iPhone vertical to iPhone horizontal. 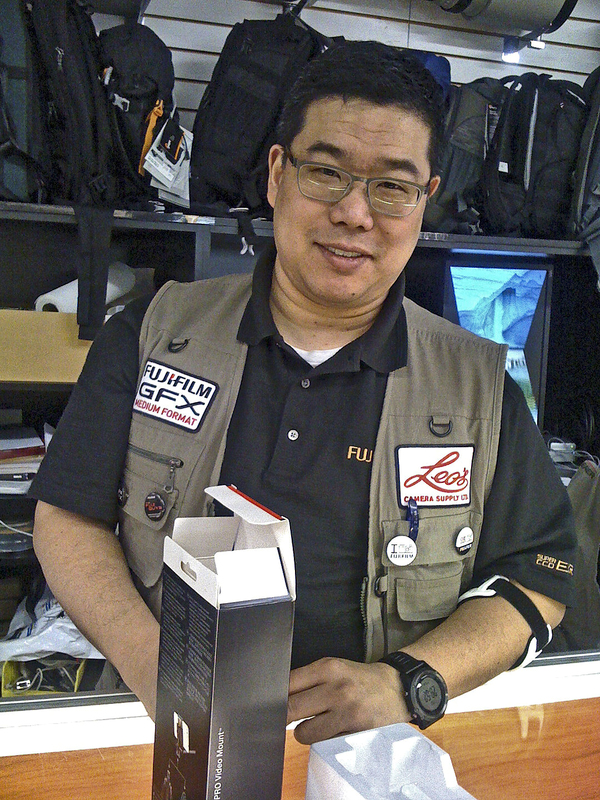 I love the service of Leo’s because it is a real camera store. The smell (heavenly) when I enter the shop is of camera metal. Their back-up to everything I have bought through the years has been excellent. Modern cameras exercise free will and, sure enough, they do stuff without their human masters telling them. It was on silent mode (and why would a camera not fire a flash on silent mode? Don’t ask me). The problem was resolved instantly. Thank you Jonas and thank you Leo’s for protecting my back. Link to: Jonas - Good Joby! 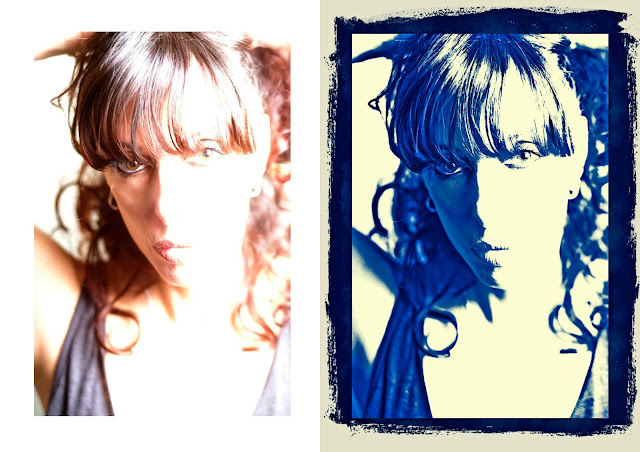 This photograph of my friend the luminous dancer Sandrine Cassini was severely overexposed on my Fuji X-E1. I had not yet adjusted the ISO rating of the camera to my studio flash settings. Because I no longer have a darkroom and particularly since these photographs are digital to begin with I have been adjusting this past year to a fully lit darkroom that is my oficina. I sit comfortably at my Edwardian desk where I have a Dell/Sony Cathode Ray Tube monitor. I look out on our deck with all its bare bones winter colour. The birds are flying around. They like the birdseed I place in the pots every day. Not quite a month ago we were visited by Cassini who occupied our guest room. She had a heavy schedule of auditions but did consent to pose for me a day before she left. I long for her to come back so I can take more photographs of her. There is something about her face, her athletic and graceful body and her French accent that somehow in those dark and rainy days of November she made me not notice the gloom.